Voice search is being increasingly used by customers to find businesses around them, complete tasks, or just help them go about their day-to-day life. Check out a few of these stats that substantiate how much voice search has changed life as we know it, and how it’ll shape the future as well. You might be thinking that there is enough time to prepare for the revolution; but the fact of the matter is that these reports are an early wake-up call. Voice-search is going to be huge, and you need to gear up for it. If you’re still wondering how’s it going affect your business, here’s a list of answers from some of the world’s top voice-search experts. From agency owners and marketers, to SEO experts, here are some of the great minds breaking down voice-search technology and why is it important for your business. Why should businesses optimise for voice search? With more people using their smartphones to search for products and services, many will begin to use the voice capability to speak into the search engine rather than trying to type on the go. If your business is in retail or hospitality, you will benefit from focusing on voice search. When people are on the go, they will more likely use voice search than textual searching. Other businesses that are not in those industries still benefit from optimizing around semantic search. So businesses need to incorporate semantic search best practices into their SEO activities. Most businesses should stop listening to SEO types (and SEO tool types) getting them all hyped up about optimising for voice search. For 99% of businesses, optimizing for voice search just means making sure your name, address and phone number is accurate in all of the data sets that voice search systems use to power their results. In most cases this is no different than what a business should be doing to make sure it is visible throughout the Web. It is important not to leave anything on the table. If you are already spending time, money and effort on keyword optimization and potentially spending money on PPC advertising you are missing a growing sector the search market if you aren’t considering voice search. The other major consideration is the number of people you see using Airpods and other wireless headsets. As this technology becomes more streamlined it will continue to grow in popularity making voice search even more important because you will be able to search via Siri or Alexa without needing to pull out your phone at all. New voice technology makes it easier than ever for people to gather information and answers from search results. History tells us that when technology develops and advances, it makes life easier for people and it changes the behaviour of consumers. There’s already a massive swing towards voice search, and I see that trend continuing. This leaves a massive opportunity for businesses who want to provide information and answers to these voice queries. The growth in voice search is staggering. 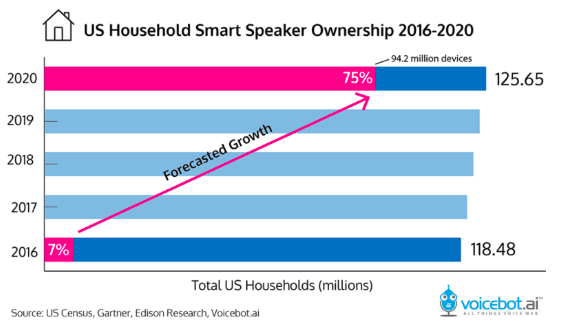 In 2016 only 7% of homes had smart speakers in the US. By 2020 this number is estimated to hit 75%. Of course, this only accounts for smart speakers as well, the majority of voice searches take place on phones. Stone Template collected some interesting statistics on the types of queries and who performs them (and where) at Mobile Voice Usage Trends 2018 which they update yearly. Essentially – if you want to get in front of the consumer, answer their questions in a way that is accessible to voice search and when possible, try to understand how your users will be searching given that voice is faster and more convenience that typing and the types of queries are different. It’s a powerful and rapidly growing area of search marketing and won’t be stopped. Voice search is the growing opportunity reflecting the changes in technology (mobile overtaking desktop search, home assistants (Amazon Akexa etc.)) and search behaviour. I expect voice search to become the go-to optimisation area for business from now until the foreseeable future. Growing demand for location based queries, plus the newer ‘near me’, ‘close by’ and other voice based intent queries will open up the online market to SMEs and empower them to compete more effectively in markets where they have premises, experts and audiences in place. Over the past decade, we’ve seen companies struggle when they have not adopted new technology to sell or market their products. In the UK we’ve seen this with many high street retailers going out of business in the last couple of years. A core reason for those businesses facing problems is that customers behaviours and expectations changed and the business didn’t. From shopping on the high street, to shopping online under their own terms with next day deliveries. Voice is shaping up to be the next shift for users. Why would anyone check with a typed search for the weather tomorrow when it’s quicker and easier to ask Alexa? So when a business’s customers are asking questions related to products they sell, those businesses need to be visible and be part of the conversation. Business entering into the voice ecosystem now will have first movers advantage, longer to learn what works and more data to improve the voice experience for their customers. Whether or not you’ve embraced it, voice search is here to stay and it looks like it will be the next biggest trend in social media. In 2014, 41% of adults surveyed said they use voice search at least once a day. By 2020, 50% of all searches will be by voice search. Google controls the lion’s share of the search engine market and it is essential to optimize your website. If you know what Google is looking for when choosing what to select for its answer box, then this will put you be in a better position to take advantage of this new trend. Business should optimize for voice search because it is an opportunity to develop a conversation with their audience. People search in different ways when they speak to their devices, so brands need to respond in kind. A lot of websites have developed FAQ pages to try and target these queries, but I see that as a stopgap measure. Forward-thinking brands will adapt their content to engage in conversational search, rather than just short Q&A exchanges. With the rise of personal assistants like Amazon’s Alexa and others, and specific products like Echo Auto which people will use in the car while out and about, people will increasingly be looking for information on local businesses by voice. Business need to make sure they can be found by voice or they risk being left on the sidelines. Firstly, the stat I’ve used before and is commonly cited is that by 2020 50% of all search will be voice. This doesn’t mean people will stop searching on desktop and mobile in favour of voice. It means they’ll search more and more, now with voice added to the picture. It’s creating another critical touch point in the marketing funnel. Secondly, we’ve found plenty of examples of major sites that lead in traditional SEO, but have zero visibility in voice search engines. We’re tracking these already at Pi and while some sites paint a positive picture of performing in both, no one can take for granted their performance in voice search. Voice is extremely natural and I believe consumers will start using voice interfaces as opposed to UI when it comes to getting information. This means that a consumer might be asking a question about your brand, and if intelligent systems like Amazon, Google and Apple’s Siri do not have this information, consumers are getting wrong information. On the other end, depth of information is going to drive discoverability for businesses. Imagine someone asks their Alexa something like this – “Where can I find a restaurant with a vegan burger, under 500 calories, which has valet parking and accepts AMEX”. As a business, you’ll need to inform systems about your attributes, menu and payment methods to be found for a search like this. Because it’s the future. Amazon and Google are firmly behind the technology and are building out ecosystems – platforms, hardware and applications – to support this. Consumers have embraced it and adoption is ramping up fast. It’s important to understand how your business fits into this new ecosystem and to develop an optimization strategy that fits those needs. Performics partnered with Northwestern University to form the Intent Lab and conduct proprietary research into customer intentions behind search activity. A recent Intent Lab study into Voice found that customers are using the different technologies for different purposes. For example, users of Amazon Alexa are searching for news more than anything else, asking Apple’s Siri about the weather, Google Assistant to report on traffic and Microsoft’s Cortana to give sports scores. Shopping, as of yet, is barely registering, even on Amazon which is the best positioned of all to dominate this function once it’s better developed and embraced. Performics Intent Lab research shows that 47% of shoppers would buy from Alexa using Amazon Prime, 29% from Apple’s Siri, 16% from Google Assistant and 8% from Microsoft Cortana. For many individuals, the use of voice search is now an everyday occurrence. Voice search usage is growing exponentially with some predicting that by 2020, 30% of all searches will be carried out via voice. Businesses can already optimise for voice search with very little effort or look to gain a competitive advantage by investing in Alexa Skills or Google Action development to build knowledge of the technology that could enable voice advertising in the future. According to Gary Vaynerchuk, “There’s nothing that’s going to disrupt marketing to the level that voice will since social media came in 2009.” That’s big stuff! Smart speaker sales grew last year by 103%, and they’re actually the fastest growing consumer technology device last year. By 2020, 50% of all searches are going to be voice searches. These numbers are staggering! Every smart phone has voice search capabilities and PCs with Windows have Cortana. Voice search is everywhere! Everyone wants to compete in this market, and there’s going to be a lot more competition. Voice search is definitely an area digital marketers and businesses need to pay attention to NOW and start preparing for. Consumers find voice search a convenient way to search for quick information – especially when they’re looking for facts, local businesses or news. (It’s much easier to talk than type on those tiny little screens; right?) Businesses need to be where their customers are – and their customers are using voice to search. That means that if businesses want to find their customers, they need to start optimizing and programming for voice search. One tip on how to optimize for voice search? In order to optimize content for voice search, first you need to understand how your audience speaks about your products and services and what questions they ask. Then you need to create content to answer those questions or update existing content to include these more natural language queries. Use natural language phrases and keep your content conversational. Modify your SEO strategy to include researching and understanding LSI (latent semantic indexing) keywords. This will enable you to create content that helps search engines determine the context of the page so it can deliver the right content based on user intent. LSI keywords are closely related to or synonyms of your main keyword and are natural language variations that can help your content rank for your main keyword and more. Use words on your pages that people tend to speak. Consider the questions your audience has and build multimedia content that answers them effectively. The key here is to be helpful not sell, by being helpful you begin a relationship with a potential customer. Creating trust with potential customers builds loyalty and credibility which can also help increase your organic ranking on Google. Google is increasingly looking to reference to best, most credible answer it can find and the better you do this, faster your organic ranking will rise. Ranking for voice searches is very similar to ranking for position 0. It requires content that should be perceived as 10x better than the competition. It should match search intent, and also match the intent of related searches. Using synonyms and trying to give the searcher all the information they can consume related to their query, and the search algorithms will love your page! If you want to optimize for voice search what you’re really optimizing for is featured snippets at this point in time. That will change in the coming years but for the short-to-mid range period, this is the path. This means looking at the featured snippets that appear for queries you’d like to rank for and considering whether the format of that snippet is ideal. If it is then produce content to take its place (i.e. easily broken into the same format but better quality) and if not, produce content that would rank but in a format that makes more sense for the featured snippet. If a question is better answered by a list – make content that includes a list, etc. Most of the content that ranks for voice queries/snippets is easily broken down into small summaries for said snippet and thus voice response but the pages that contain them tend to be thorough with a couple thousand words. This may not be the case moving forward but making sure your page contains all the supporting data for that answer is essential. And of course, you need authority. But it takes that for all queries and not just voice. It’s driven by features snippets (Google Answers) and location based queries, so I would urge people to make the most out of creating destination pages for the locations they operate in and make these content rich resources. It’s a great chance to breathe fresh life into blogs as well by closely targeting Google Answers most relevant to your audience. Start simple. Get an Alexa device or a Google Home speaker and start asking questions relevant to your products and business. If you don’t have a device you can use https://echosim.io/ welcome or https://allo.google.com/ which are web versions of the two assistants. Learn what the assistants can answer. What they can’t answer. Where are there gaps for you provide that answer. At ROAST we’ve developed tools that allow us to bulk query the Google Assistant and then classify the results by type. This allows us to pick key phrase where we could provide an answer either with an web answer box or using a Google action. You can download the findings from 10,000 key phrase across 23 verticals from our website – Voice Search Vertical Report – Q3 2018. Google prefers that voice search results are short and easy to read. At the same time, it seems to prefer long-form content (over 1000 words) as opposed to short-form content. Confusing, I know. It comes down to the type of questions that are being asked. For search queries that have a simple or clear answer, Google wants something that is brief and accurate. In order to catch both the Google Home and Chrome users, think about how to structure your posts so that Google can find an answer users can click to find more detailed information. Stick with simple vocabulary and shorter sentences to maintain readability. Make use of structured data. When responding to a voice query, a search engine has to navigate masses of information to find a suitable response. There is less room for manoeuvre here, as voice search typically lends itself to only one answer. Help the search engines find your content by using the Schema.org standard to draw attention to key pieces of information like price and product availability. One obvious challenge is when words are spelled differently than they are pronounced, or in a non-obvious way. But I think every search engine has their own ways for addressing that issue, and I am not personally familiar with the tools for that. I could give a lot, but I like to give the ones that won’t just help out in voice, but also help all your SEO. So of those I would say focus on becoming an authority on a subject matter. Have lots of interlinked articles that really and truly explore a topic. Use a tool like Synup – this will get your business information on the most important voice services! At a very basic level, businesses should look to research and answer conversational queries in order to appear for the types of queries often being used in voice searches. The content used to answer these questions should be concise, with the question answered within the first paragraph for greater chance of being returned as a featured snippet. Bonus points for those enhancing their content using speakable and how to schema. Will traditional search completely fade out in the coming years? I believe that the way people search will evolve as people become more comfortable using voice search. In addition, search engine results will evolve with the use of AI. But what will not change is that businesses need to understand how people search for their products and services and tailor SEO practices to accommodate. People will continue to type search queries into a search engine, but they will be typing in more conversational language where understanding the context is important. Therefore marketers need to think like their customers and ensure they create content that appeals to their needs and not the needs of the search engine results. I don’t think “traditional search” is going away anytime soon. Primarily because the voice search queries that are applicable to businesses trying to get customers are pretty much “traditional searches” whether they are done by voice or by keyboard. I’m not sure traditional search has ever existed. Search engines have been evolving so rapidly and with the advent, and now growth, of machine learning being used across search and other platforms the speed of change looks only to increase. What I can feel confident saying is that as humans create and adopt technology that brings further convenience to their lives, search will adapt to these changes because their success in inextricably linked to the tools we use, whatever they may look like in the future. Search as we know it is changing, but that doesn’t mean that traditional search methods will fade. It’s still challenging to complete certain tasks using just voice. For example, if you wanted to make a complex purchase, it’s still much easier to do on a desktop or mobile device. Over time, though, voice searching will improve and the better the technology gets, the more consumers will continue to use it. My best guess is that voice search will start playing a huge role in the conversion cycle. Whether that means users complete purchases using voice or not is yet to be seen, but they can certainly start consuming information and reviews to help make more informed purchasing decisions. Not at all, but it’s going to change dramatically. The notion that I will be sitting at my desktop through the various interactions I have with a brand is gone. I may ask my home speaker, I may ask my phone or I may ask one of the myriad of devices coming up that will respond a question that begins my journey to a conversion. Amazon has just announced an Alexa-powered microwave. A query to the microwave beginning with a recipe request may well end with a grocery order so there will be instances where voice is the full conversion, but there will be many if not most cases where a simple question that starts with a recipe (for example) moves to a different device (Alexa, show me that bread maker on the living room TV.) which may end there or may simply result in an Amazon ad for said bread maker appearing the next time you sit down at your computer where the conversion finally takes place. There are functions that take place on the myraid of different devices. We simply need to understand what our users are doing at the various times they interact with them and market to them in an appropriate manner. At its core I see voice search, augmented reality and the other various technologies coming up as additional routes to the consumer rather than replacements for existing ones. People will continue to spend as much or more time in front of screens and they’ll still be using keyboards on many of them. Just not all. No. The 50% of search by voice by 2020 stat has been branded around too much and it’s dependant on what you class a search as. For example “Ok Google play some jazz music.” I wouldn’t class that as a search. However some do class that as a search query. I think what will happen is certain verticals or key phrase sets that are more conducive to voice could reach 70-80% of searches via voice while others will remain mainly web or mobile searched. It depends on the intent of the search, “Ok Google what time is it in New Zealand?” would have the potential for a high number of voice searches, the user just wants to know the time. While “Ok Google itinerary for a 3 week holiday in New Zealand” the user will want to read a detailed itinerary, view maps and picture something that isn’t conducive to a result being read out. One development that could change this is the adoption of multimodal, starting the search via voice and then moving to a screen. “Alexa, where are the best beaches in Portugal?” Alexa responds and then shows a map or picture on your Alexa enabled TV. With regular search SEO, being within the first ten results and displayed on the front page of the search engine results was enough. Voice search makes this game more competitive because now all SEO and SEM marketers are aiming to have their content returned as the featured snippet that is displayed above the first organic result. The featured snippet typically displays the text from your site answering the question and an image. It may be daunting to hear all the digital marketing pundits talk about how voice search is going to disrupt everything we know about search engines. It’s important to remember that voice SEO is still just SEO. The fundamental purpose and functioning of search will not change. The industry has always been in a process of development; it is just that the pace of change is accelerating. That said, I see search becoming truly ambient, accessible through voice, image, or text in any context. It will also become more intelligent and capable of preempting our questions before we even ask them. However, people will still need answers and they will still communicate with a search engine to find them. In that sense, search will never truly change. As much as I am an advocate of voice, I don’t see traditional search disappearing any time soon. There are plenty of situations where it’s too noisy, or searchers want to respect the privacy and conversations of others around them, and they will continue to type queries in the traditional way. Not at all. I use a mobile search when I’m out or at home, but I use it for simple answers, articles and access to easy to use services. I use a desktop search when I am at work or when I need to interact with something complicated like bills or housing, and I’ll use voice for quick and convenient snippets of information when I’m alone or my hands are covered in food! They’re all different use cases defined by by location but also by interaction with the device. Voice is faster, and opens up new interaction points, but it doesn’t replace desktop or mobile functionality. I believe otherwise. Traditional search will continue to exist, and the systems that power current search algorithms will continue powering a majority of intelligent voice assistants. In fact, I believe that search on mobile devices will continue to grow with a lot of the emerging world just getting connected to the internet. There are early days and technology trends and adoption are very difficult to predict. That said, Voice certainly seems poised to become the dominant way to search for information. Although voice (and visual) search will never replace text-based search altogether, it will certainly open up a world of possibilities for smart marketers who can utilise it to their advantage to promote brand awareness through useful voice activated apps available on Google Home and Alexa devices. I don’t think that traditional search will fade out completely. There will always be a need for more detailed information – and that generally means using additional keywords than people use with voice search. Voice search will only get you so far and only provide you with so much information. However, with the advancement of technology, like the Amazon Echo Show and Google Assistant Smart Displays, search may start moving more from computers to those types of devices when people are looking for quick bits of information. For example, if those types of devices start coming with small keyboards, people might start with a voice search, see the voice search results on the screen and then proceed with more refined keyword research to get more detailed/refined long-tail search results. So the way people search may change, but ultimately I believe that searchers will always have the need for detailed search results. Depending on how voice search technologies and AI develop over the coming years…we will just have to wait and see! To conclude, looks like we are rapidly approaching a voice-first world when it comes to searches. Consumers search is changing, and you need to ensure that your business information and any other related content is voice-search-ready. It is only going to help your business scale-up in terms of discovery. It’s time you embrace the voice-search revolution. I am Varsha, the Community Manager at Synup. Following and talking to journalists and influencers is not just a part of my job, but something I genuinely love! I cook to de-stress, and good music and dance gets me going; love drama, and secretly wish I was an actor.